I have a craving for teatime snacks. So, either I make them regularly or at least get them from a nearby shop. Masala Peanuts or timepass munching palli as we call them are one among them. They are very easy to make and tasty. Serve them with a hot cup of tea. OR munch them while reading any interesting fictitious novels of #Jeffrey Archer's or #Chetan Bhagat's. I made a couple of cups of them on a weekend day and they are off even before the end of holidays. 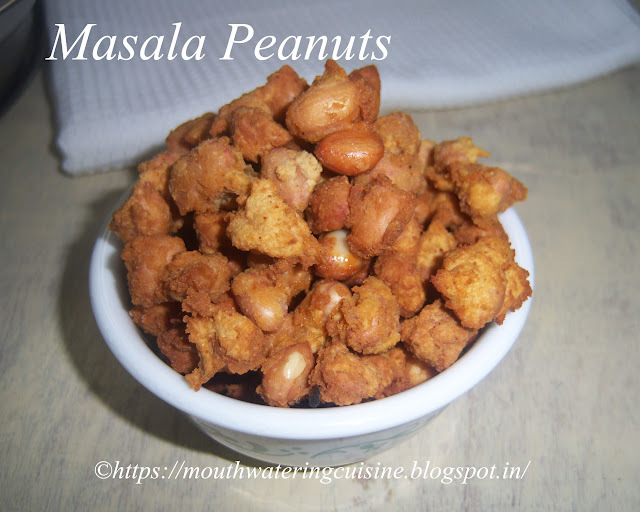 Masala peanuts -- a healthy, crunchy teatime snack. Wash and soak peanuts in little water for half an hour. Drain excess water and keep it aside. 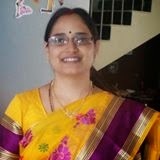 In a large mixing bowl mix chicpea flour, rice flour, salt, red chilli powder, garam masala and coriander powder well. Add soaked peanuts to it. Mix well so that all the masala combine with peanuts evenly. If necessary add little water, as little as one to two table spoons. Heat oil in a kadai till the fumes come up. Reduce the flame to low to medium. Drop each coated peanuts slowly from one corner in the hot oil. Fry them on low to medium flame only till they turn light golden colour. Take them onto a kitchen towel. I fried them twice to get more crispy. If we have fry them second time, let them cool for a while and again drop them in the oil and fry for a second or two. 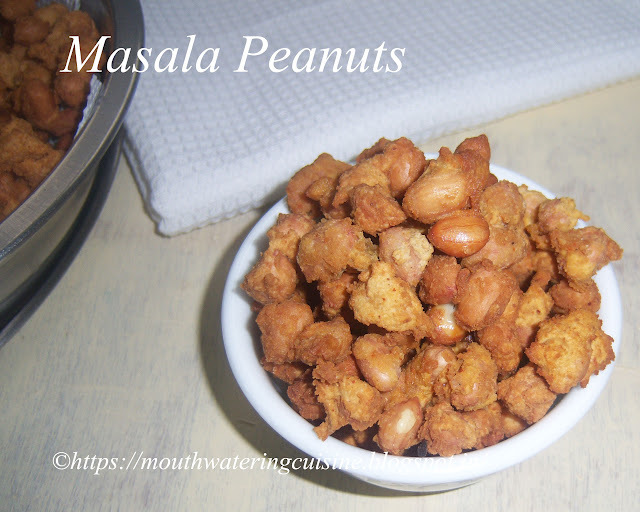 Serve masala peanuts with a hot cup of tea. For more teatime snacks click here.Thank you for visiting my blog. Hope you liked all my recipes. Any feedback and comments are appreciated.